Wild jubilation erupted in Rivers State, yesterday, following military confirmation that notorious kidnapper, cultist and killer, Johnson Igwedibia, aka Don Waney, has been killed by security operatives. The 6 Division, Nigerian Army, Port Harcourt, disclosed that a combined team of military, Department of State Services, DSS, and the Police killed Don Waney in a rented apartment, in an undisclosed community in Enugu State, alongside his second-in-command, one Ikechukwu, and one of his commanders. 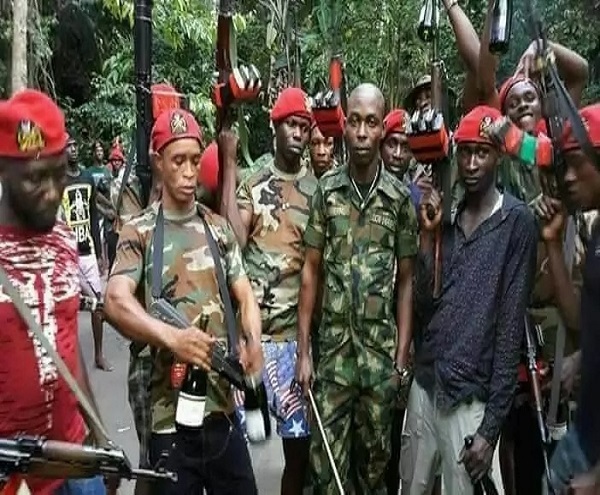 The joint security force had launched a manhunt for the killer and his gang after they killed over 21 persons returning from Church services on New Year day in Omoku, Ogba/Ndoni/Egbema Local Government Area of the state. At the 6 Army Division, where the military displayed and handed the three bodies to the Police, outgoing General Officer Commanding, 6 Division, Major General Eni-Obong Udoh, noted that Don Waney was killed in a joint operation involving the Army, Police and DSS. Udoh said: “You can recall that in the early hours of January 1, 22 innocent people of Omoku were heartlessly murdered while returning from New Year Eve service. “There was a presidential directive that the perpetrators of that act must be brought down. We were given a mandate to collaborate with other security agencies in the state to hunt the gang down. “We trailed them to Enugu, where they were living in a rented apartment. They were living in Imo State before then. We collaborated with the GOC, in charge of 82 Division and raided their home. “Don Waney was mastermind of the January 1 incident, but the attack was physically led by Ikechukwu, his Second-in-Command and there is another accomplice we will not mention now, but we will get him. Earlier, in a statement by Colonel Aminu Ilyasu, Deputy Director Army Public Relations, the military recalled that “in the early hours of Monday, November 20, 2017, troops of 6 Division, acting on credible information from some patriotic members of the public, raided Don Waney’s enclave in Omoku, ONELGA, Rivers State, where shocking discoveries of assorted weapons, dynamites, bags of suspected cannabis, full military camouflage uniforms, military boots, military communication radios, 10 human skulls and human bones were discovered. “Additionally, in continuation of the operation, on Tuesday, November 21, 2017, the troops also exhumed decomposing bodies of some of his victims in his shrine, with the media present. “Perhaps not satisfied with the numerous lives of innocent citizens he took, Don Waney masterminded the despicable New Year day mayhem in Omoku, in which he led his notorious gang of criminals to murder 23 peace-loving citizens of Omoku, who were returning from service at about 1:30a.m., on Monday January 1. Colonel Ilyasu continued: “From the relative safety of his hideout, Don Waney was already perfecting plans to wreak mayhem in Omoku in which he was to attack churches, schools, Army and Police locations and residences of already traumatised Omoku populace. “Following his successful geo-location of his new Enugu hideout by the DSS, a combined team of troops of 82 Division, Nigerian Army, Enugu, and personnel of DSS Rivers State Command raided the hideout to arrest him and his other accomplices. “Incidentally on sensing that the combined team were closing in on him, Don Waney, his Second-in-Command (Ikechukwu Adiele) and another gang member (Lucky Ode) attempted to escape through a back exit. “But they were shot down by eagle-eyed troops. One of them died on the spot. Two others, who sustained gunshot injuries, eventually died while being evacuated for medical attention. According to Vanguard, the Army condoled with families of victims killed in the January 1 attack, soliciting further cooperation in volunteering useful information to track down and arrest the remaining gang members to return peace to the area.